And so my love affair with pancakes continue! These are honestly to die for and are delightfully nourishing too. I always create my recipes with your health (and mine) in mind. Food is delicious and pleasurable to eat, but we also need to make sure that it actually benefits us. Traditional pancakes are high GI, very carby, packed with sugar and leave us feeling sluggish (kind of a like a food coma). This however doesn’t mean we can’t enjoy pancakes, all it means is that we need to choose the RIGHT ingredients. This pancake deliciousness is rich in protein, very low in carbohydrates and contains healthy fats to keep our joints healthy and our tummies happy. These pancakes will leave you feeling so satisfied and full of energy. They will also keep you feeling full for hours. All these things combine make for the perfect recipe to support healthy weight loss while satisfying your sweet tooth. Pour mixture into a blender. Add blueberries and blend for 1 minute until well combined. Place coconut oil in large frying pan on maximum heat and allow to melt. Using a soup ladle, spoon crumpet sized amounts of the mixture at a time into frying pan. Allow to fry until you start seeing air bubbles form on the top on the pancake. This will happen within 10-15 seconds of pouring the mixture into the pan. Once you begin to see these air bubbles, flip the pancake over and cook on the other side for 10 seconds. In a separate bowl, add creamed cottage cheese, vanilla, cinnamon berries, crushed pecans and maple syrup. Whisk together thoroughly for 1 minute. Leave aside. Place pancake open on serving plate, spoon generous amounts of the cheesecake filling into the middle of the pancake. Roll up and top with more cheesecake filling, whole blueberries and crushed pecans. 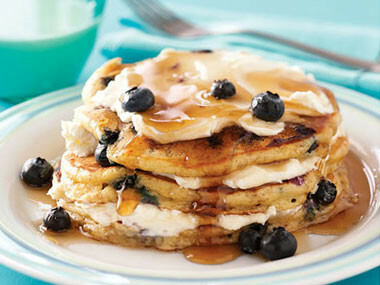 Drizzle with maple syrup and enjoy!